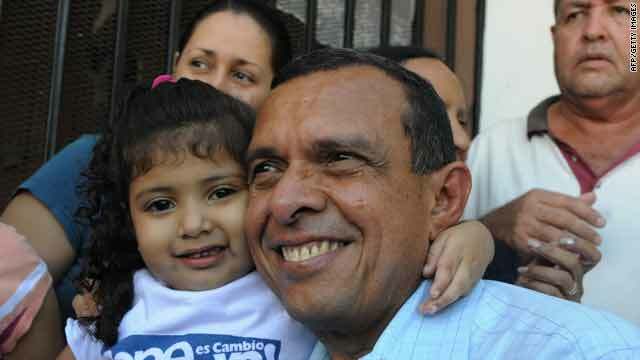 Porfirio Lobo, Honduran presidential candidate for the National Party, poses after casting his vote Sunday in Juticalpa. Tegucigalpa, Honduras (CNN) -- Conservative candidate Porfirio Lobo gave a jubilant speech of appreciation to supporters early Monday, as preliminary results showed him leading in the Honduran presidential election. Hopes worldwide were pinned on the election ending a political stalemate sparked by a coup in June. The National Party of Honduras candidate had 56 percent of the vote in the Sunday ballot, election officials said. Political crisis has gripped Honduras since the military forced President Jose Manuel Zelaya from office on June 28. Zelaya's supporters called for a boycott on grounds that participating in the vote would legitimize the de facto government of Roberto Micheletti, who replaced Zelaya. Despite fears of unrest, election day was calm and without major incident. About 35,000 police and soldiers were deployed across the country. The de facto government is hoping the international community will recognize the winner. The coup, condemned worldwide, led to the cutting of foreign aid to Honduras and dealt a painful blow to its economy. Costa Rican President Oscar Arias has said his government will recognize the election results. So has the United States, which said the clock will be reset after the elections. In the aftermath of Zelaya's ouster, the United Nations, the Organization of American States, the European Union and most nations -- including the United States -- condemned the coup and demanded that he be reinstated immediately. Five months later, the ousted president is holed up in the Brazilian embassy in the Honduran capital, where he sought refuge after secretly returning to his country on September 21. The supreme court has ruled that Zelaya cannot return to office without facing trial on charges that he acted unconstitutionally when he tried to hold a referendum that could have changed presidential term limits. Micheletti stepped down temporarily to distance himself from Sunday's vote. He said he will resume office Wednesday. Sunday's ballot will also decide 128 seats in the nation's unicameral Congress, as well as other local posts. The new president is to be sworn in January 27. CNN en Español's Patricia Janiot and CNN's Cody Combs contributed to this report.